VMware Horizon® support for published applications provides exciting new opportunities for customers running Citrix XenApp. Tightly integrated with Microsoft Remote Desktop Services (RDS), VMware Horizon is a new option for delivering not just published applications and shared desktops, but also virtual desktops, software as a service (SaaS), and virtualized applications to the devices your end users want to use. 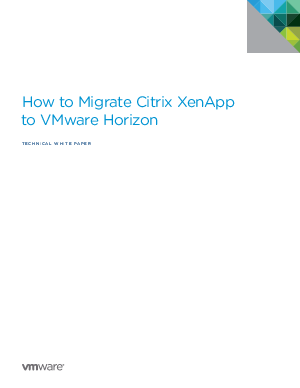 This white paper provides guidance for planning and undertaking a migration from Citrix XenApp to VMware Horizon. Four approaches to XenApp migration are detailed, including the major steps required for their implementation. Whether the goal is to migrate an existing XenApp infrastructure to Horizon, replace it with a new system, or simply integrate legacy Citrix infrastructure with your Horizon virtual desktop deployment, VMware has the innovative products and technology you need.